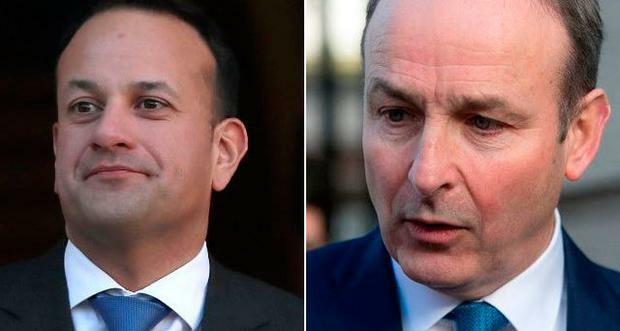 Both party leaders have again said they remain at odds over when to begin talks on renewing the so-called “Confidence and Supply Agreement” which underpins the Fine Gael-led minority coalition. But after a short meeting in Kerry they have signalled peace is now likely to reign until the Dáil returns in September. Yesterday it emerged the pair had met in Killarney, Co Kerry, on Thursday evening, in a break from canvass tours by both leaders in the south-west. In a terse joint statement the two party leaders revealed they discussed Brexit, the upcoming Budget, and referendums due to be held in the autumn. Crucially, they also discussed that deal whereby Fianna Fáil facilitates the Fine Gael-led minority government where Mr Varadkar (below, left) has presided as Taoiseach since June 2017. The deal was put together after 70 days of stalemate following the inconclusive February 2016 General Election and it allowed then Fine Gael leader, Enda Kenny, to become Taoiseach. It provided for Fianna Fáil facilitating three Budgets, and also at least abstaining in any Dáil confidence votes against the Government. The last of the three Budgets is currently being prepared and due to be presented next October but there have been tensions about when a review clause kicks in for the agreement. The Taoiseach has repeatedly said he wants the renewal talks to begin before October’s Budget. Mr Martin (below, right) has been sticking closer to the letter of the document which speaks of the end of 2018. A Fine Gael spokesperson described the meeting as “a constructive discussion on a range of issues”. The statement from both parties said that Mr Varadkar gave his views on the need to review and renew the deal between Fine Gael and Fianna Fáil. The statement also said that Mr Martin reiterated his view that the review of the Confidence and Supply Agreement is provided for at the end of 2018. Both parties said Mr Varadkar and Mr Martin agreed to meet again in September and in the meantime they will engage on the upcoming budget. Spiky public exchanges on the issue over the recent weeks had fuelled speculation a general election would happen soon. But in more recent days both parties have been sending out more conciliatory signals. Some within Fine Gael feel they should capitalise on positive economic indicators, and a significant lead in opinion polls and take their case to the voters sooner rather than later. Others in the party counsel caution and warn they lack a good reason to call an election at this point. Fianna Fáil members are unhappy, fearing they lack a clear identity. But many fear they are not prepared.